The United States Patent Office has issued the patent for the 2015 edition of Split Flow — an innovative API centrifugal pump that employs two different impellers in the same pump casing. The new Split Flow applies to both overhung and between bearing pumps. The new patent is a substantial upgrade from the original, 1997 version of Split Flow, which only covered overhung pumps. Read more about the new Split Flow™ here, and a succinct summary here. One Split Flow pump can do the work of two standard pumps, at significant energy and cost savings. The patented Split Flow feature allows the use of smaller motors, thus lowering electricity usage. Less kilowatt consumption means less draw on the electricity plants that power the pump fleet. This means less carbon dioxide emissions — whether it is from the burning of coal or even the relatively clean natural gas, the main feedstocks for power plants. 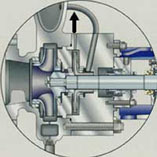 Use of the Split Flowpumps results in an annual kW saving of about $25,000. 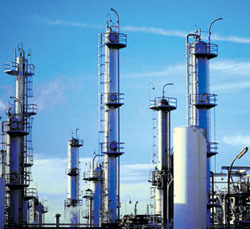 Two Split Flow prototype pumps were installed in June, 1996 at the Shell refinery in Martinez, Calif., and operated successfully throughout the duration of the pumps' service lifetime. Read more about the Shell project here. Split Flow technology can be applied to save significant capital and operating costs for API pump installations. This savings is enjoyed by the refiner, the customer and the environment. Quite simply, Split Flow is a more efficient pump selection for dual service applications. It saves energy, and thus reduces carbon emissions. Split Flow™ API centrifugal pumps provide a solution to oil refiners. See new article on Split Flow™ in Pumps & Systems. See article on Split Flow™ in Hydrocarbon World. This site is intended to inform process and pump engineers that the Split Flow feature is available as an option with API Standard 610 pumps when used for dual service. This option allows use of smaller motor drivers — resulting in energy savings — and use of two pumps instead of four to limit redundant multiplicity.